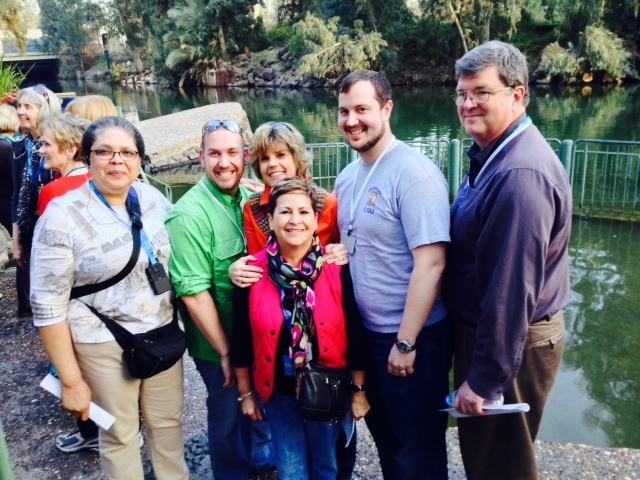 Nearly 100 United Methodists from throughout Louisiana are currently visiting the Holy Land with Bishop Cynthia Fierro Harvey until Jan. 22. The group will tour key Biblical cities including Galilee, Nazareth, Jericho and Jerusalem. Bishop Harvey is pictured, center, beside the Jordan River with Revs. Cheri Godwin, Chris McLain, Betsy Eaves, Jared Williams and Steve London. The five are recent ordinands in connection with the Louisiana Annual Conference.